In contemporary Ethiopia, the extent and rapidity of socio-spatial transformations multiplies the opportunities for people to claim for justice as well as the ways to convey demands. The panel « Justice from below (1): Searching for a Right to the City in a transitional urban Ethiopia” (coordinated by Sabine Planel and Marie Bridonneau) has addressed the socio-political transition in Ethiopia, through its urban dimension. This panel then aimed at contributing to the emerging debate over the Right to the City in Ethiopia in a dynamic way by articulating the analytical fit between political experiments and city dwelling, which are apparent in the Ethiopian context in a triangle of political and social emancipation, urban relocation and access to private property. It questioned the capacity of urban dwellers to produce and to access the urban spaces that are highly affected by urban renewals and redevelopment projects. Firstly, in his paper entitled “Rights from the street corner in Mekelle. An ethnographic analysis of an unruly youth group in the mutable urban scenario”, Mario Marasco analysed the urban transitional social context of Mekelle city. Within an ethnographic approach, the research has focused on the debates on a slice of urban life, where a group of young people is the protagonist. These youths are a kind of “corner boys society”, often accused legitimately or not of not having a working attitude and of being violent small criminals or cheaters. The analysis will start from an audiovisual document – provided by Tigray Television – in which a recent mediation process is reported between Da Gabriel guys and young people from another block, « enemies » during a period of street fights. The traditional mediation process is called Erki, which here becomes an interesting scene in which various social parts – street guys groups, administrators, elders, religious leaders, neighbours try to express the ideology of their subgroup and their claims of « justice » in the city. Then Clélie Nallet has focused on how urban renewals are affecting the position of Addis Ababa “middle classes” in the city and in urban society, and how they produce strategies to deal with the city reconfigurations and to access urban spaces. The survey has revealed that Addis Ababa intermediate social space is principally characterized by the social diversity of its members. The presentation developed the multiple and complex relations these intermediate social groups have with their capacity to compose with urban renewals, to produce and access the urban spaces – which is a stake at the core of their upward social mobility ambitions. Finally, Sabine Planel and Marie Bridonneau aimed to unravel the politics of every day life and offer a political ‘grassroots’ analysis of urban change, from the standpoint of materiality of space – rather than from the ability of dwellers to resort to a language of rights against authoritarian practices or neoliberal agendas. Ever since the 2000’s, policies that promote access to housing are a key tool to the Ethiopian government’s economic planning strategy and its political project. This politicization of urban renewal intertwines a top-down and state-led management of access to public housing and the variety of individual/entrepreneurial strategies or bricolages that dwellers daily implement to answer or bypass state’s requirements. This presentation has observed this potential socio-political shift on the basis of a fine-grained analysis of homeowners associations (committee) recently promoted inside condominiums sites. Following these three presentations, an interesting discussion took place with the audience about living experiences in condominium sites, definition of middle classes and subaltern groups’ relations to justice. Corporate Social Responsibility (CSR) is not completely a new issue in Ethiopia even if only few published reports and even fewer scientific articles (Robertson, 2009; Rajasekhara Mouly Potluri, Zelalem Temesgen, 2008) have addressed this topic. 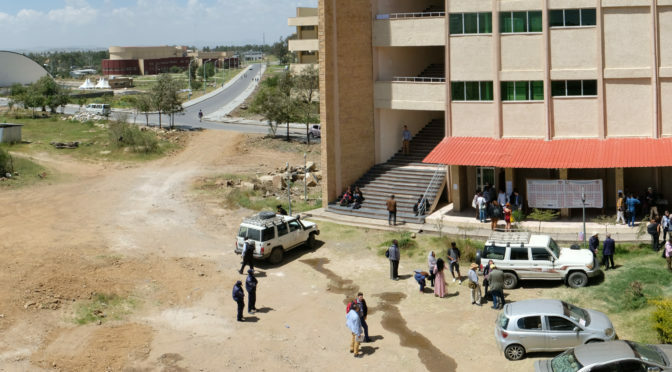 But this subject was a new question in the International Conference of Ethiopian Studies held in Mekelle, witnessing the growing interest for socio-economic inquiries in Ethiopia. The panel entitled « Entrepreneurship, Entreprises and Social Responsability » has first crossed CSR with the Developmental State program. Tesfaye Fentaw Nigatu, from Wollo University, has presented the CSR ideological framework, and to what extend it is compatible with the political way of economic development in Ethiopia. We can regret that his presentation was based on very few field data (the author has essentially studied firms’ websites). But the goal of the author, to promote a new way of CSR and more adapted to the Ethiopian context, promises a fruitful perspective for research. Secondly, the panel has addressed entrepreneurship in a more general scope. Self-employment has been questioned as a way to empower people and promote economic growth. Most of contributions are based on quantitative data, which is quite classical for this topic, in particular in economic studies. Maybe that’s why they reinforces outcomes well-known and don’t achieve to give new findings on this topic. Nevertheless all these papers contribute to a better knowledge on Ethiopian economy. The panel entitled « Development and Labour in The Horn of Africa » was also innovative because of its focus on labor forces. Organized by Stefano Belluci and Andreas Admasie, both form Leiden University (in Netherlands), it aims to compare workplaces in a long-term perspective. For instance, Massimo Zaccaria (University of Pavia, Italia) has described the process of recruitment of indigenous soldiers from the Italian colonies. He has particularly described the involvement of Eritreans and Ethiopians in the expedition in Libya. Completing the historical view of labor (through history of Ethiopian labour legislations (Girma Negash Ture), the agency of Italian labor immigrants working in colonial enterprises (Stefano Bellucci)…), the issues of collective labor relations have been raised with the presentation of Andreas Admasie (about strikes, struggles and wage between 1960 and 2010) and Camille Pellerin studying the relationships and interactions between trade unions and the Ethiopian ruling party. Eventually, some presenters have addressed labor forces issues in emerging economic sectors in Ethiopia, representatives of the priorities of the Growth and Transformation Plan: the division of work in Leather shoes industry (Kana Matsubara); the unequal participation of women in eco-tourism sector (Gubaye Assaye Alamineh et al.) and the impact of factory employment on the fertility choices of female workers (Halvorsen). These last presentations were unique in having questioned the effects of the Ethiopian economic policies on workers themselves. Rajasekhara Mouly Potluri, Zelalem Temesgen, 2008, Corporate social responsibility: an attitude of Ethiopian corporates, Social Responsibility Journal, Vol. 4, 4, pp. 456-463, https://doi.org/10.1108/17471110810909867. Robertson D., 2009, Corporate Social Responsibility and Different Stages of Economic Development: Singapore, Turkey, and Ethiopia, Journal of Business Ethics, Vol. 88, pp. 617-633. Tewelde Mezgobo, 2013, The Nature of Corporate Social Responsibility (CSR) in Ethiopian Business Context (March 1, 2013). Available at SSRN: https://ssrn.com/abstract=2462800.